I'm in a cooking group with two other friends where we get together every other Wednesday to cook dinner. The kids all run around a play while we girls chat and visit while whipping up a meal for our 3 families. I think it helps to bring back some of the joy of cooking that can be lacking while a 2 year old is throwing a tantrum at your feet! This week was my turn to pick the recipe, so I modified one I'd found to make it my own. 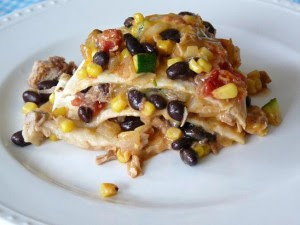 This can be prepared gluten free if you use corn instead of flour tortillas. Served with a side of homemade Spanish rice and you've got a delicious meal. In a large skillet, heat your oil. Then add onion and saute for 5 minutes. Add the garlic and saute for a minute more. Over medium heat, add ground turkey, chili powder and cumin. Cook the mixture until the meat is cooked through (about 3 minutes). Add the salt, water, black beans and corn. Bring the mixture to a boil. Allow it to continue boiling, stirring occasionally, until the liquid evaporates, about 20 minutes. Remove the mixture from heat and allow it to cool slightly for about 10 minutes. Mix together salsa & sour cream and set aside. Spray the bottom of a 9" round cake pan with olive oil or cooking spray. Lay a tortilla in the pan's bottom. Spread a quarter of the salsa/sour cream mixture on top of the tortilla followed by a quarter of the beef mixture. Then sprinkle a quarter of the grated cheese on top. Place another tortilla on top of the cheese and repeat the layering until the ingredients and tortillas are used up. You should end up with a top layer of cheese. Bake the lasagna for about 30 minutes, until heated through. In the chaos of getting dinner on the table, I forgot to take a picture, this one looks similar... it's from here.